UNION LAKE, Mich. – (January 16, 2019) – Lindenwood University maintains its hold among the top spot in the 2018-2019 American Collegiate Hockey Association Men’s Division-I Ranking, No. 11. The Lions (16-0-0) were set to start 2019 with a home series against No. 4 Ohio University (12-3-3), but Mother Nature had other ideas as both games were postponed due to a snowstorm. 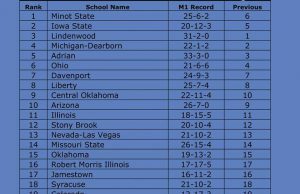 The University of Michigan-Dearborn (11-1-1) retained its No. 2 spot with a road split against Davenport University to end the first semester and a home sweep of Western Michigan University (12-2, 5-3) to start the new year. The Panthers handed the Wolverines their first regulation loss of the season, 3-2, as Austin Thompson netted two goals and Jason Rhynold made 30 saves in goal. The next night, Justin Dunn had a natural hat trick as the Wolverines responded with a 4-2 win. No. 3 Adrian College (17-1-0) was idle while No. 4 Ohio’s game against Lindenwood were postponed as previously mentioned. Jumping up a spot and rounding out the top 5 is Iowa State University (12-4-0), which swept Missouri State University on the road. Friday night, Nathan Marquardt had 4 goals and an assist to lead the way in a 5-0 romp with Matt Goedeke making 20 stops for the shutout. On Saturday, Nicholas Sandy and Adam Alcott each tallied a goal and an assist as the Cyclones squeaked out a 5-4 win despite a 46-save performance from Bear goalie Bailey Stephens. Moving into the polls this week is No. 25 Western Michigan University, while Kent State University drops out of the Top 25. 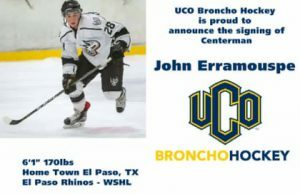 The Central States Collegiate Hockey League leads the way with all five of its member teams ranked, while the Western Collegiate Hockey League has six (of 8) of its member teams ranked, the Eastern States Collegiate Hockey League has four (of 6) of its member teams ranked, and the Great Lakes Collegiate Hockey League has three (of 8) of its member teams ranked. 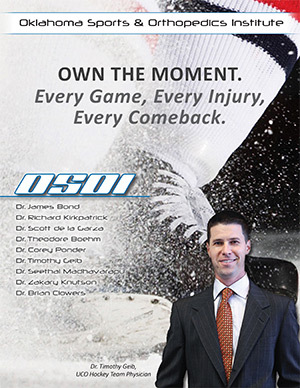 The ACHA uses two computer rankings generated by USHSHO.com, Ranking A (Wins with Maximum Goal Differential of 7) and Ranking B (Wins with Maximum Goal Differential of 1), and come up with an average of the two rankings. The ACHA will then use the list generated from the average for its weekly ranking. Ties will be broken using the higher ranked team from Ranking B until the Top 25 teams are listed. All games that go to overtime will be scored as ties in the computer ranking. 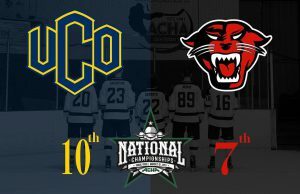 Over the past 16 seasons, 12 different schools have won the ACHA Men’s Division-I National Championship: Lindenwood (3), Central Oklahoma (2), Illinois (2), Adrian, Arizona State, Davenport, Delaware, Minot State, Oakland, Ohio, Penn State, and Rhode Island. A total of 60 teams are competing in Men’s Division-I this season, including two new teams: the University of Toledo and William Paterson University. The two teams that have departed Men’s Division-Iinclude Midland University and Saint Bonaventure University. The 2019 ACHA Men’s Division-INational Championships will be hosted March 21-26 for the first time by the Dallas Sports Commission, Dallas Stars, and StarCenters at the Dr Pepper Arena, in Frisco, TX. This will be the eighth year of the 20-team format.